I apologize for my prolonged absence and for not posting anything for months. I cannot even say that I was extremely busy – at least not all of the time – but there was a fair amount of things going on and maybe I just needed a bit of a break from the blog as well. From now on I hope to be able to update this blog more often! I took this picture near where I live. 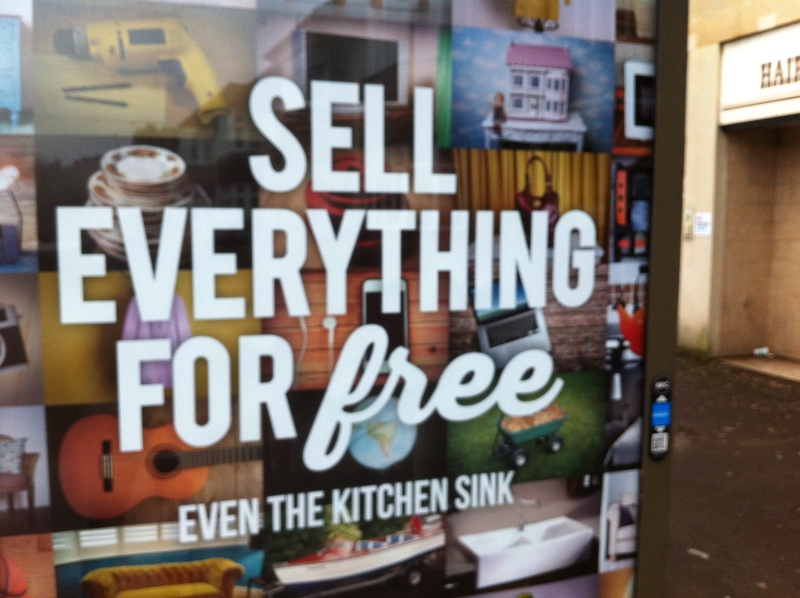 It’s an advertisement for Gumtree – a website where you can sell or buy pretty much anything, from cars to furniture (and some people do sell sinks there!) – and it reminded me of a funny expression ‘everything but the kitchen sink‘, which means, well, everything you can imagine. – The kitchen needs to look at its salads which contain everything but the kitchen sink (Oxford Dictionary). – Peter went to London for the weekend with a huge bag of things – clothes, computers, his special shampoo… He really took everything but the kitchen sink (BBC Learning English). – So he took the “everything but the kitchen sink” approach to reform – ranging from a ban on MPs getting involved in lobbying through to fixed-term parliaments. He even talked about moving towards a written constitution (BBC).